Just a few years ago, the cattle were lowing on the Ludwig Dairy Farm in Black Creek, but their soft ‘moos’ and shuffling hooves have nothing to do with a nativity scene and baby Jesus. The cows needed to be milked three times a day, 356 days a year. They didn’t care if it was Christmas! Fast-forward to 2014, and there is not a bovine in sight on the 650-acre parcel of land. Based on a family decision to try something new, the cows were all sold. Although the cow sheds still stand as a testament to the farmstead’s proud history, they have been re-purposed for other agricultural business uses. The once large dairy operation, milking more than 260 Holstein cattle, has undergone a generational shift that now encompasses several businesses working together. Within the four generations of the Ludwig and O’Brennan families operating the farm are Big D’s Bees Honey, Ludwig Lumber, Amanda O’Brennan Photography and Coastal Black Estate Winery. There is a new excitement in the air, and it is the pitter-patter of reindeer hooves that breaks the silence of a starry night because Coastal Black recently acquired a game-farm licence and is now home to seven reindeer. Dubbed ‘Sven and Ivan’, the two eldest of the small herd, will play the roles of Prancer and Dancer for the month of December when the farm opens its doors to families for the second annual Coastal Black Christmas Festival. This special family-friendly event will run every weekend from November 29 through December 23. Last year’s inaugural festival attracted more than 8,700 visitors. While it is, of course, weather dependant, this year there are more activities and attractions. Attendance is anticipated to be more than 12,000. The Christmas Festival sees the Coastal Black family and staff shifting gears from the busy, adult-oriented summer season to welcome a wide range of multi-generational families, businesses, community groups and individuals to come together and celebrate the best of the season. The second time around for the Coastal Black Christmas Festival sees an expansion in many areas. Visitors can expect to see some of the same attractions as the previous year such as live entertainment, photos with Santa and more than 6,000 feet of Christmas lights, but with some new and exciting elements. 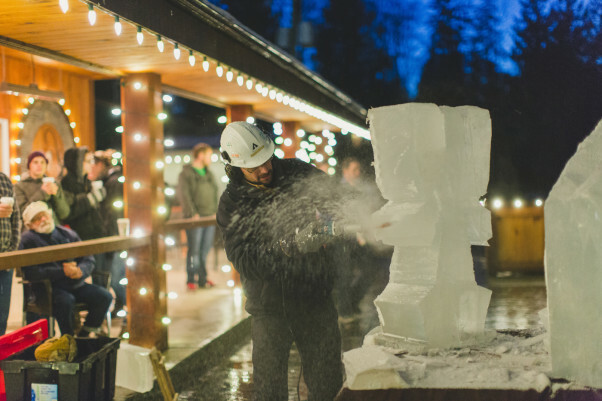 Long lasting memories will be made with unique attractions such as the live reindeer, the authentic nativity scene, professional ice carving demonstrations, and much more. The wine tasting room and a full concession will be open, and there will be lots of interactive and fun games that kids can do with their mittens on. Coastal Black is also excited to be partnering with two local charities for their Christmas Festival this year. Habitat for Humanity (Vancouver Island North) has come on board for the ‘Celebration of Trees’. This fundraising activity will allow guests to browse through trees decorated by local businesses and to vote on their favorites. Habitat for Humanity is a charitable organization that works with partner families to build safe and affordable homes for families in need. Half of the proceeds from the Celebration of Trees will be donated directly to the Vancouver Island North division of Habitat for Humanity. Coastal Black will also be working directly with Children’s Health Vancouver Island (CHVI) for the entire course of the festival. CHVI is a registered charity that raises funds to support the health of children and youth on Vancouver Island and the Gulf Islands, with roots going back to 1922. Donations to this foundation are carefully allocated to facilities, programs, special projects, and urgently needed medical equipment that helps ensure children with health issues and disabilities receive the care they need to have every chance possible. The Coastal Black Christmas Festival will be donating one dollar from every admission fee to Children’s Health Vancouver Island. Aside from the seasonal celebrations, the Coastal Black Christmas Festival also gives people the opportunity to visit a productive farm to appreciate just how much it contributes to the local economy. It is a poignant reminder that the richness of life and the bountiful harvest we are so blessed to enjoy in the Comox Valley comes from the hard work and life-long dedication of farmers, in an economy where diversity can be the secret to success. “Our family farm is made up of four generations living and working together to produce products of the highest standard, whether it be wine, fresh market fruit, raw honey, or custom milled lumber,” says Abel O’Brennan, the farm manager. With the help of a seasonal staff of about 35, as well as family members, the farmers cultivate 80 acres of blackberries, 20 acres each of raspberries and blueberries, 40 acres of corn and 15 acres of miscellaneous squash and pumpkins. While the majority of these crops are sold to Vancouver Island grocery stores, about 30 per cent is retained for use within the award-winning winery. Since opening their doors in 2010, the winery has earned 27 national and international awards, including a Gold Medal and Best in Class at Savour Northwest, a wine competition for Alaska, BC, Washington, Oregon and Idaho. Winemaker Abel O’Brennan has also garnered some attention, being named as both one of the Comox Valley Chamber of Commerce’s Top 40 Under 40, and one of Vancouver Island’s Top 20 Under 40. Beekeeping is the perfect complement to the berry farm. All those berries need to be pollinated, and honey is a value-added ingredient used to make a fine selection of Coastal Black meads. While there are no award competitions for honey production, beekeeper Daniel Ludwig is still enjoying sweet success. He now tends to more than 600 hives (more than 60,000 bees per colony) and Big D’s Bees Honey is sold to stores across Vancouver Island and at the Comox Valley Farmers’ Market. In addition to being a productive farm, Coastal Black has also become a popular event venue and a tourist destination. One of the cow sheds was converted into a beautiful open barn-style event space that can accommodate groups of up to 350 for weddings and other special celebrations. There is also a wine tasting room and a Bistro that serves delicious and creative food made from scratch, using as much farm-grown and local food ingredients as possible. Their artisan pizzas and breads, made fresh daily and baked in an outdoor wood-fire brick oven, are worth making a trip to the farm. Sorry to tempt your taste buds though, but you will have to wait until spring to try them. Except for special events, the Bistro is closed for the season. This past summer, the winery held successful events in support of local charities including YANA and Cameryn’s Cause for Kids Society. The winery also hosted a vintage movie night as a fundraiser for Tour De Rock. And the farm has just wrapped up the Coastal Black Pumpkin Festival, organized by beekeeper Daniel Ludwig and his wife Justine. This year more than 12,000 local and out of town guests came to the property during the month of October to enjoy the Pumpkin Fest activities. The Coastal Black Christmas Festival runs from 2:00 to 8:00 pm, November 29- 30, December 5-7, 12-14 and 19-23. Admission is $6 per person, with children age five and under free. The admission includes a $1 donation to Children’s Health Vancouver Island and $3 ‘Festival Bucks’, which are redeemable anywhere within the festival. To learn more visit www.coastalblack.ca or in person during business hours at 2186 Endall Road, Black Creek.